The harp is one of our most ancient musical instruments. Today’s modern harp is the result of a long process of development that probably began several millennia in the dim past when some stone-age hunter discovered that his bowstring produced a musical note when he plucked it. The rest, as they say, is history. Harps and harp players have held important places in many past civilizations, including Africa, China, the prehistoric Middle East, medieval Europe, and, in more recent times, the Celtic lands of Wales, Brittany, Scotland and Ireland and many countries in South America. During most of that history, the harp itself was a relatively simple instrument, with strings attached at top and bottom of a bowed or triangular shape. 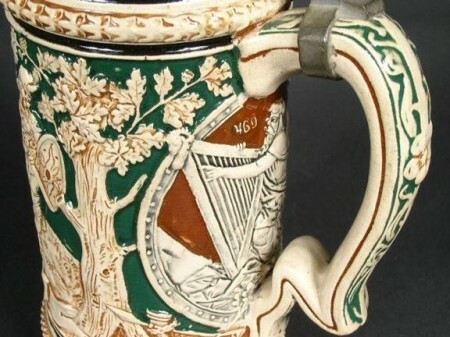 Another (nicer I think) version of David and his harp on an earlier Westerwald pottery wine jug, See castle in background… and notice he is facing opposite of that shown on V & B Mettlach n.o. 6 10.5 inches. Circa 1870. Harps are symbolic of “harmony with the universe” and ascent to higher things; a bridge between heaven and earth. In Judaism, the harp is a symbol of David, conqueror of Goliath and king of Israel. 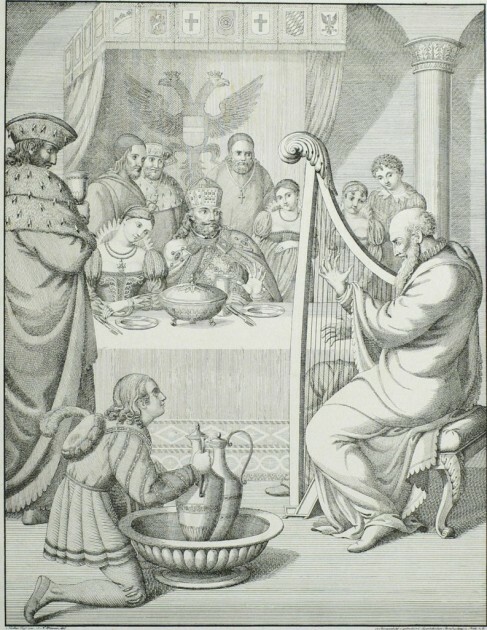 David’s harp playing relieved King Saul’s depression and when he became king, the midnight wind playing on a harp that overhung his bed called him to study the Torah. 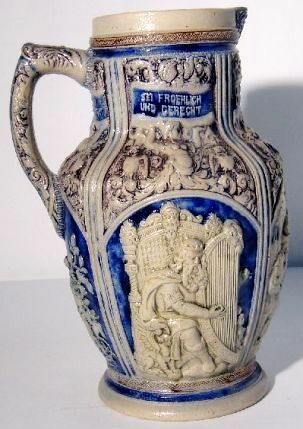 The .5 liter pottery relief stein showing the harpist on the rear. [B] Beginning of the first century and medieval harps: After centuries in hiding, the harp reappeared in Western Civilization. The earliest known mention of the word ” harpa” occurred about AD 600 by Venetius Fortunatus, the Bishop of Poitier. In northern Europe, the Germanic tribes played a type of harp lyre called in Old English the “harpa.” Mentioned in Beowulf, the harp may have been the instrument to accompany the performance of Anglo-Saxon poems and stories such as Beowulf. The remains of several such Germanic harps, dating from the fifth through the tenth century, have been found in Saxon and Frankish graves in Germany and England. The harp had such mystical significance that many kings or chieftains had harpers in their employ, believing the instrument to possess magical powers. Harpers were second only to the chieftain or king, often serving as advisers and leading armies into battle in order to bring luck to the warriors, to hail the heroes, and to recount battles to the tribes and clans. Unarmed, they were recognized and respected by the enemy and immune from harm. 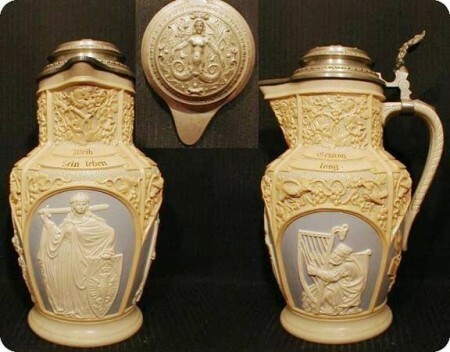 Above▲: A seated harpist is shown to the rear of the scene, on the 3 liter pottery relief serving stein, shown below ▼. An harpist as a warrior, shown as a pewter thumblift. The fifth century brought forth the King Arthur legends. The magician Merlin was believed to have played the harp. Also during the fifth century, the Papal Music School was established in Ireland and the harp was taught. Fragments of a six-stringed harp were found in the 7th-century Sutton Hoo burial ship unearthed at Suffolk, England. The depiction of a harp was also discovered in stone carvings dating from the 600’s AD in Hexam, Northumberland in the British Isles. Harps played by the harpers of the old Gaelic order was an aristocratic instrument, played in the courts of kings and before the chiefs of clans. It had an important role in legend and folklore. About the 13th century, when Feudalism reached its height, the Troubadours began appearing. They would pluck their harps and sing their graceful melodies and advanced the cause of Chivalry. European harpers earned their living by moving from town to town, using small harps for self-accompanied singing, storytelling, and in instrumental consorts. Medieval harps were apparently wire strung, typically had out-curving fore-pillars, and eventually were tuned diatonically (seven notes per octave).From the middle of the 14th to 16th century, larger harps known as Gothic harps appeared. This harp had around 24 gut strings and was a tall instrument carved into pointed corners like a Gothic arch. This Gothic harp is the ancestor of the folk harps of Latin America and of the modern “Irish” and orchestral harps. STEVE’S NOTE: In the book: ‘PRINCELY TREASURES” the author Geza von Habsburg shows an ivory carving of David, dated from 1620 to 1625. (Ill # 190, page 146). This figure is holding an ancient harp. The right angle of the harp is towards his head and the top of the harp (NECK) goes out horizontally from his head, while the side (COLUMN) goes down his body about to his groin. The strings therefore go out diagonally from the smallest being closer to David’s body. There is a mythological head on the finial of the harp (COLUMN), farthest away from David’s face. 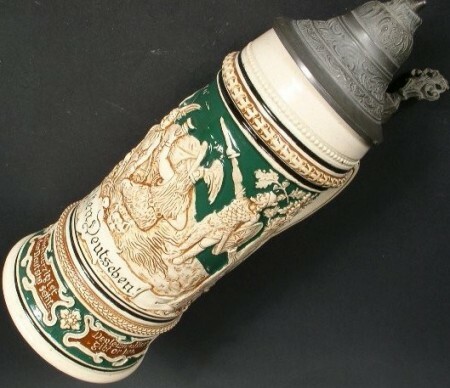 While the figures shown on the Mettlach is correct, the finial is on the wrong end of the horizontal piece (NECK). 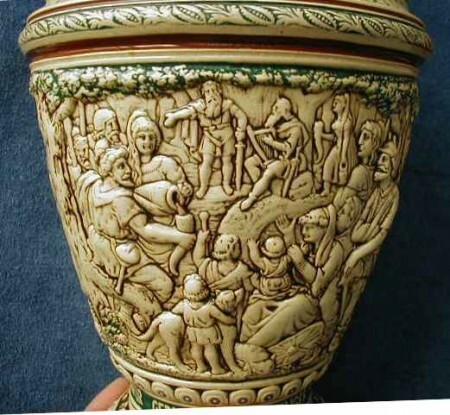 The figure shown on the ½ liter pottery relief stein (above three) is more correct, or at least more consistent with the ivory rendering.